1. Join the CV network for FREE! On the phone - We call you (200+ calls a day) or you call us. Anyone looking to get married and you want help or represent them. Now you have no reason to shy away from creating a CV. Public - Only Members can see the CV or anyone using the CV code. Private - Only the one who knows the Private CV Code. Hidden - Only you and us, so we keep an eye out for you. Create a CV, by filling in the form, so we know you are serious! We contact you regarding a potential match. 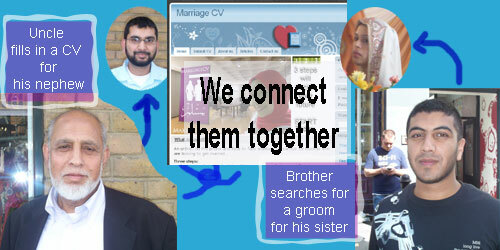 You contact us regarding a potential match. We contact both parties to encourage them to take things further. The traditional way..
Everyone does their bit to get this ummah moving..
Full guide coming soon, which will go through every element of the process including filling in CVs, photo uploads to charges etc.